October Training: After the Marathon, Fall Camp, and Halloween! After running Twin Cities Marathon on October 4th I took it easy for a couple days. Mostly my quadriceps, the left more than the right, were very sore. It hurt when I first stood up (I considered being able to get out of bed a big accomplishment) and really hurt going up and down stairs. I previously heard people say easy biking is a great way to recovery so I got to it after the marathon when I biked to a party and then resumed biking my 6 miles to work the following day. I’m pretty well known for usually always riding in one moderately high gear on my bike, but for three days I actually stayed in pretty low gears and did lots of spinning. The day after the marathon my recovery was a bit impeded when a coworker brought a soccer ball to work to try out the new artificial turf soccer field across the street. Having played soccer back in high school, I couldn’t quite resist the temptation to kick the soccer ball around for awhile (and I always say I’m not competitive!). So even though I had to walk down the stairs backwards, I made it out to the new field and kicked the ball around for about an hour. Because I consider my primary sport to be Nordic skiing, I didn’t want to take too many easy days. I also think by training properly for the marathon and by doing activities other than running, I was able to resume a fairly normal training load within 3 days of the marathon. Two days after the marathon I did a 30 minute classic rollerski I had been thinking about doing as an easy workout before the marathon. Three days after the marathon my soreness dissipated, I could walk down the stairs without pain, put some strength into my biking, and did 2 x 1 km double pole time trials at our weekly Wednesday Vakava session. I was only 3 seconds slower than my best time so I think I was reasonably well recovered. 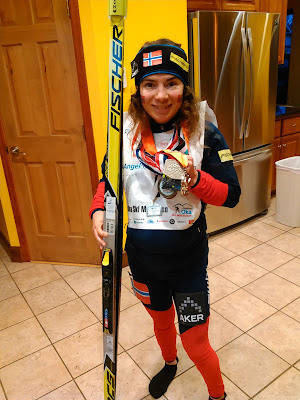 By four days after the marathon I was able to run 5 miles and rollerski for over an hour and after that the rest is history. The week after the marathon the Minnesota Orienteering Club held their annual Corn Maze-O at Sever’s Corn Maze in Shakopee. This is a bit of a twist on usual orienteering courses which tend to be held in the woods at state parks but this is truly a really fun time. Erik and I have done this the last 2 years and we did it again this year. My family was visiting so I drug my mom and my brothers with their significant others out of bed early on a Sunday morning to go to the Corn Maze-O and everyone had a great time! It’s super fun and if you’ve never done an orienteering race you should do one. Go to mnoc.org to look at the schedule. 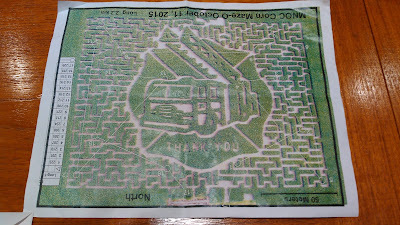 The map from the Corn Maze-O; this years maze featured a fire truck in the center. The weekend of October 16-18 I attended my first Vakava Fall Camp based out of Cable and OO. This is my second year on Vakava and prior to that over the previous 10 years or so I have done very few structured workouts where someone else tells me what to do. It does make me a bit nervous when someone else plans my workout but at the Master’s level I do appreciate that we can always individualize the workout if needed. On late Friday afternoon we started with a pole hike from the Birkie Ridge Trailhead. The most adventurous in the group did a 10 mile trail run; I did a 7 mile pole hike with a bit of running. Saturday morning we did classic intervals on a nicely paved road northeast of Cable. I was a bit surprised the workout was to do 8 x 5 minutes of intervals. Because of the terrain, most of the intervals were just under 5 minutes. We got videotaped on 3 of these intervals and on those 3 we did an interval start versus a group start. I liked switching up this format a bit because I think it helps keep things fresh. We then had lunch at OO and after a lengthy break of staying warm in front of the fire and reviewing our video technique, we did a strength workout followed by a bit of ski walking and bounding, and then finished with a game of frisbee. I felt tired on the hill bounding (like my heart rate felt like it got high pretty fast) but once we started the game of frisbee it seemed everyone was fresh! Funny how some competition can get the legs and heart moving again. Then we went to Rivers Eatery in Cable for lots of pizza. On Sunday morning we finished camp with a three hour skate rollerski heading northeast from Cable. The roads were mostly very well paved and low traffic which is nice. We did an out-and-back route. Along the way we did a few pick-ups about every 8 minutes or so. The fastest in our group looped back to pick up the slower skiers so that way we all stayed together. I’ve been having some foot issues inside my right boot but didn’t have that issue so I was pretty glad. After that we headed to OO to eat more food (compliments of Michelle Oja who supplied our lunch both days) and then we headed home. I ended up not being sore at all on Monday (maybe I should have done those jumps in the strength session a bit more exuberantly) and was surprised to actually not feel very tired. Many weeks this year I have done back to back intervals on successive days. We usually do rollerski intervals at our Wednesday night Vakava training session and then Thursday I have the day off and usually do running intervals. For whatever reason I’m most motivated to do these running intervals on Thursdays. This provides a miny intensity block but somehow I seem to be recovering really well this year. I’m not sure if it’s because of all the base I have done over the last many years or what but it feels pretty awesome. I was particularly happy when 3 weeks after the marathon I was able to do 5 x 6 minute classic rollerski intervals followed the next morning with 4 x 3 minute running intervals (and I did these all at sub 7 minute mile pace). After these two interval sessions though I usually give it another week before I do more intervals. I’m hoping these back to back interval sessions will be my secret (not so secret after this is published) weapon for this upcoming race season. Me trying to look like Marit! It's not easy to see in this picture but I did add some bicep implants because mine aren't very Marit-esque. Then as always October ends with Halloween. I haven’t been in costume in a few years but this year I actually had a couple Halloween parties to attend so I had to make a costume. I like to use things I have and this year my inspiration were my multiple medals (a few years ago Erik went as Michael Phelps and wore all of his and my medals). 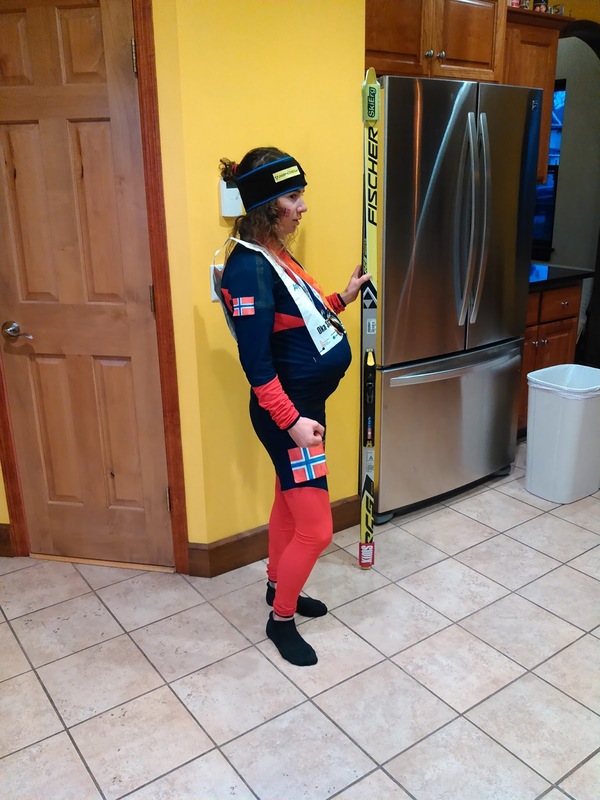 Unfortunately, not too many skiers attended either Halloween party so I’m posting my costume here for the skiers to enjoy. 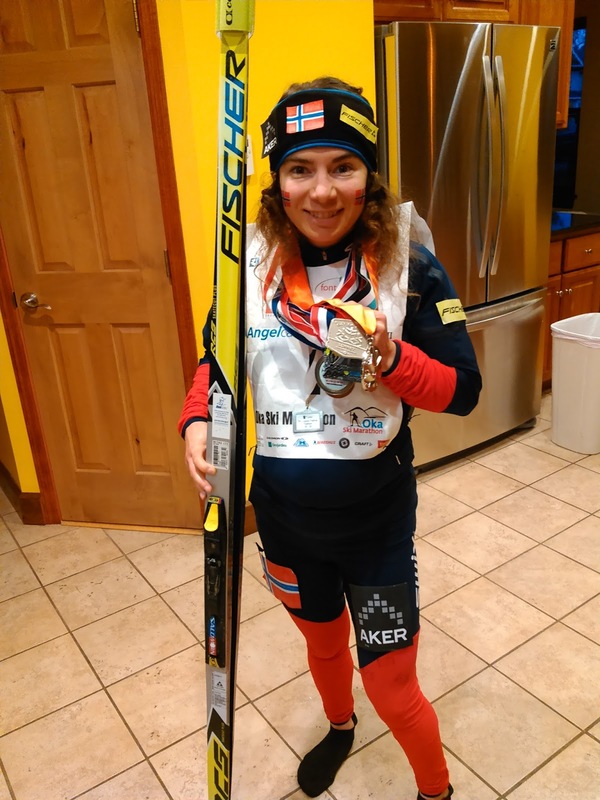 Showing off my medals and sponsors. At my first go-around of this picture I put my headband on upside down. Oops! I guess that's why I'm not a pro.